I get various questions from different posts which I don't always find enough time to answer. Ergo, here is some info. 1) What non-fiction book are you reading right now and why? I won't be including the titles that relate to my work here as, well, they are "special interest" titles. Unless you're interested in reading about new scholarship on the Middle Ages. If that's the case, let me know and I'll attend to the questions. -Bob Woodward, well, because he seems to be so well-respected, and most importantly, he writes like a true historian who does think that context does matters. A whole lot. I will be reviewing this book soon. -The reason why I'm reading Friedman is because I read his column on the NY Times regularly and because he is writing about a most relevant topic: global warming. -Maya Angelou? Well, because it is Maya Angelou. 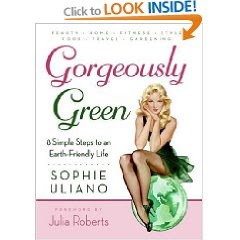 -And lastly, I'm reading Gorgeously Green because I am trying to implement green-living techniques in my quotidian experience. I will end up blogging about this title, too. I have two more titles I'll be starting this week. Courtesy of Paul's suggestion. More to come. What music are you listening to and why? - Well, again, there is no secret that, at least recently, I've been almost exclusively Keane-bound. I rarely get so thoroughly impressed by one single album but, as I've mentioned before, it's that good! -Because I always have time for Beethoven. The 7th Symphony always delivers. -The Magnetic Fields are somewhat of a staple. Two different friends informed me the night before of their concert in town and while efforts were made to make it, no success was met. Ergo, to compensate, I am listening to them. -Sean Lennon's Friendly Fire. One solid reason: Liam says this album is to him was Keane's latest seems to be to me. I didn't give it a lot of attention when it first came out due to much new music being released around the same time. However, I am absolutely loving it now. John's son gets music. Jenny Lewis' new album Acid Tongue is breath-taking. Plus, I am a big fan of Rilo Kiley so it makes good sense that I would like her stuff too. I'll be reviewing her latest album soon. Which news programs do you watch and why? I tend to be a reader of news more than a watcher. However, when time allows for it, I try to catch a few news programs. Meet the Press is one. Even though I was a more regular viewer when the late Tim Russert was doing it. The Daily Show has proven to be a good source of information with regard to new books. Plus, few people get political satire the way Stewart does. I've liked Colbert since first discovering him on the Amy Sedaris' show Strangers with Candy. And I absolutely love his [satirical] efforts to be lexicography-minded. The segment of his show named 'The Word' is one from which many contemporary players might learn a thing or two. I don't always manage to catch Rachel Maddow but when I do, it feels like a good decision. The Oxford-educated commentator who also has a radio show on Air America is well-poised, witty, and impressively quick. She also has a knack for contextualizations. Keith Olbermann, well, I suppose I fell in the trap of Olbermann's charm as apparently so many others before me did. Again, I don't manage to catch him often but when I do, see the aforementioned Maddow comment. Did you know she was in an episode of the Golden Girls. She plays a Girl Scout who refuses to give Rose back her teddy bear. FUNNY! The Woodward does look interesting. I saw him on Maher last week. Did you catch Rachel's bit on fruit flies and autism research? I didn't know about Jenny Lewis but I like some of the Rilo Kiley tracks I've heard. thx. IS the Maya Angelou an autobiog or a collection of poetry? Olbermann all the way. I love his Worse, Worser, Worst bit. I watch Rachel b/c I first saw her when she was filling in for Olbermann. Witty, for sure!!! I see you didn't mention Maureen Dowd...? Which tracks should I look out for on the Sean Lennon album? I'll read that Gloriously Green book. I saw the Woodward title and was going to ask you if had read it, so good. Looking forward to the review.